If you are looking to be a Transport Coordinator then look at why this role interests you and what you have done to date that means that you feel able to perform in this role? You could have worked your way up to this role through the transport sector or you could have some different experience that crosses over. Look for any similarities in your experience and the job description of what you are applying for. You will help to ensure the smooth running of a busy transport division from organising routes and deliveries to coordinating the right drivers with the right routes, locations etc. You will need to have good background of transport including a good knowledge base to do this role well. I am an organised professional who enjoys working in the Transport sector. I have worked in this area for a number of years now and understand the importance of ensuring the best routes and times are scheduled to ensure the smooth running of a busy transport department. I have excellent time management skills and feel that I have organised and coordinated things well in previous roles and enjoy putting the time and effort into this to make something run smoothly. I am efficient in my work and work well with others. I enjoy learning about transport and I am always keen to update my skills in this area to the benefit of my company. I am keen to progress within this role and would one day like to manage my own department. 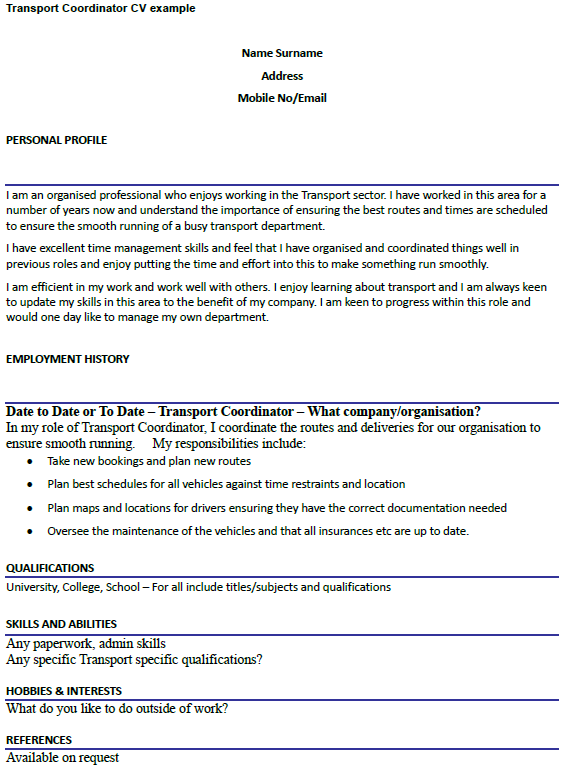 Date to Date or To Date – Transport Coordinator – What company/organisation? Oversee the maintenance of the vehicles and that all insurances etc are up to date. Any specific Transport specific qualifications?